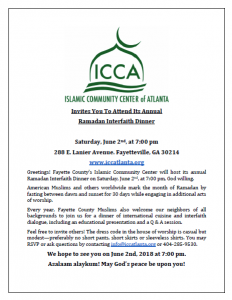 The Islamic Community Center of Atlanta will host our annual Ramadan Interfaith Dinner Saturday, June 2, at 7:00 PM. Please share the attached invitation with your friends, neighbors and co-workers of different faiths. The event will include a meet and greet period, followed by a presentation about Islam, a Q&A session, and iftar after Maghrib. Please share the invitation far and wide, and please join us promptly at 7:00 pm on Saturday, June 2nd to share our faith and community with our neighbors.